Warren Gill is a narrow, secluded valley just a stone's throw from Fearby Cross, near Masham. With its winding beck , wild flowers, scattered trees and stands of vibrant yellow gorse it is a peaceful enough spot until the shooting begins, that is. Over the last few years Dave and Ann Elgie have been transforming Warren Gill into a state-of-the-art shooting ground. 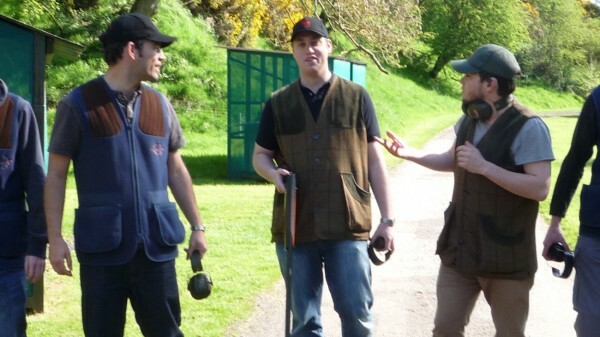 Both are passionate clay pigeon shooters, and their enthusiasm is certainly infectious. They soon had us properly kitted out waistcoats with padded leather shoulders, safety glasses, ear defenders and hats and raring to have a go. There can't be much about shooting that Dave Elgie doesn't know. With 45 years experience under his belt he's one of the finest shots in the country, let alone Yorkshire . But despite his awesome reputation he still treats bumbling beginners like us with what seems like infinite patience. No one has ever left Warren Gill without hitting a fair few clays, he tells us and it is clear he has no intention of letting us be exceptions to the rule. Dave may be a consummate professional, but fortunately he isn't in the least intimidating. We all start with a session of one-to-one tuition on how to hold the gun, and how to sight along the barrel. When the time comes to fire the first shot, it all seems remarkably easy. The clay hurtles out of the trap (that's the machine that fires it) and up and over the hawthorns on the ridge. You squeeze the trigger there's a bang and there is the clay still soaring aloft on its merry way, quite unharmed. But Dave refuses to let you be discouraged. A few minor corrections are all that is needed, he insists. Aim a bit higher next time. One the second attempt your shot nibbles the edge of the clay. On your third shot the little black circle explodes in a glorious cascade of fragments. Unless you are Stef, the graphic designer, in which case you hit the clay first time. In fact Stef seems to be able to hit anything and everything, with unfailing accuracy. The rest of us console ourselves with the observation that it must be something to do with the gusty weather. Our clays were blowing hither and yon in the teeth of a gale that mysteriously dropped everytime Stef took up the gun only to resume shortly afterwards. Nonetheless, we had all experienced out first taste of success. And the thrill that a hit gives you is undoubtedly addictive. Had the weather been less unseasonable - or had we had the sense to bring warm clothing - we could have happily stayed all day.